Leadership is a familiar role for Sister Rosann Ocken. 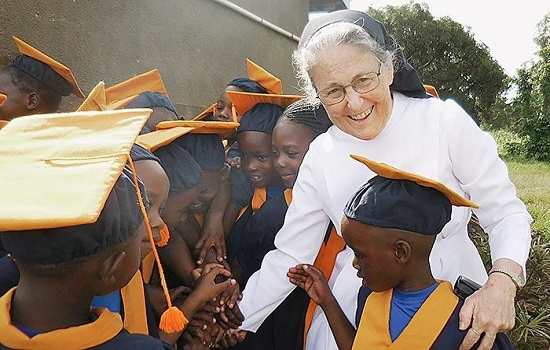 For almost 11 years, the Missionary Benedictine sister has led religious communities in their ministries to impoverished regions of east Africa, spearheading efforts to develop schools, build health centers for women and children and expand care for people suffering from HIV/AIDS and leprosy. On Wednesday, Sister Rosann began a new leadership role that will provide a different set of challenges: That’s when she was installed as prioress of Immaculata Monastery & Spirituality Center in Norfolk. The ministries of the sisters at the Norfolk monastery, however, are vastly different from those of the sisters with whom she served in Africa. Sister Rosann is not a stranger to Norfolk. She calls Immaculata her home, the community with which she became familiar as a little girl and joined nearly 50 years ago. Sister Rosann left Norfolk in 2007, when she was elected to serve as prioress of St. Scholastica Priory in Peramiho, Tanzania. At the time, her biggest concerns were overcoming language barriers and cultural differences. But while at Peramiho, she led the community of 56 sisters and 17 sisters-in-formation in the construction a new orphanage, the completion of the first phase of a primary school and the expansion of a girls boarding school. She also spearheaded efforts to renovate a leprosarium, helped begin a new HIV/AIDS outreach program and saw the beginning of efforts to complete a surgical unit at the health center in Uwemba, Tanzania, that focused on mothers experiencing difficult pregnancies. In 2015, she left Tanzania after being called to serve as the regional superior of the smaller religious community of St. Benedict Monastery in Jinja, Uganda. While in Uganda, she saw the number of sisters in the community increase, and she again helped lead the expansion of an HIV/AIDS ministry and the maternal health and mother and child clinics. The community in Uganda is on the cusp of building a new boys dorm and has architectural drawings done for a new dining hall and classrooms for the 600-student school there. “Parent-teacher meetings are held in this (small area). ... People are standing outside listening through windows because they have no large facilities for this 600-student school,” she said. Her term as regional superior in Uganda was to end in July, but she was asked by the Missionary Benedictine Sisters’ mother general last fall if she would be open to having her name on the ballot as Immaculata prepared to elect a new prioress. But Sister Rosann said she also felt she needed to be at Immaculata, where the main ministry is the retreat center. The community also supports foreign missions and the Winnebago Indian Mission and has a new community developing in Sioux City. Outreach to youths is another important area in which the Norfolk community is making a concerted effort. Sister Rosann said the community is grateful to have two postulants, a novice and a junior sister among its members. But, she added, there is work to be done in reaching out to youths so there is better understanding of what it means to live a life of vocation. “Our sisters have tried to be where the young people are with their faith development,” she said. Sister Rosann said she views her life of vocation as a wonderful gift and believes she has been empowered by God to meet the challenges she has faced. Through that empowerment, she has been able to improve the lives of others. Last summer, she visited the community in Tanzania and cried with joy when she saw the completed renovations on the health center and the new surgery unit that had begun under her leadership. “It makes you feel so happy that good can happen, and it can continue after you’re gone,” she said. Sister Rosann said she wants others — especially youths —to know the joy that can come from a life of vocation and believes God will continue to help her rise to the challenge of her new leadership role at Immaculata.